Hats and Rabbits: Sherlock: How Did I Miss This? First: yes, I know -- I am really late on this; two seasons behind, in fact. Anyway, I heard about this BBC series a few weeks ago and then I found out it was available on Netflix. I finally watched it last night. To say I was excited is an understatement. I was giddy. I was silly with joy. (I think I told my wife that my happiness compared to that of our wedding day. I certainly would never have said it surpassed it.) I'm a huge fan of Sir Arthur Conan Doyle's Sherlock Holmes stories. In my not-so-humble opinion, the series, Sherlock, is wonderful. The dynamic, as I have always seen it between Holmes and Watson in the original stories, is perfectly captured by both Martin Freeman (Watson) and Benedict Cumberbatch (Holmes). And Holmes doesn't have that off-putting, unwholesome weirdness that Jeremy Brett gave him. (I know -- people loved him, but all I could think was that I would definitely keep the Baker Street Irregulars from spending time alone in 221B with Brett's Holmes.) 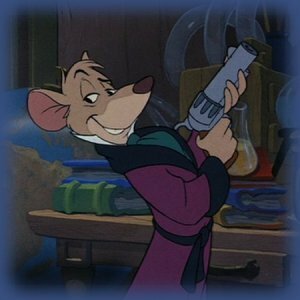 I always thought that if one crossed Basil Rathbone with Disney's Basil of Baker Street, one would have the perfect Holmes. That's Cumberbatch. The writing is Doylesque and the modern elements are seamlessly integrated into Holmes's personality (which, for its time, was cutting edge, anyway). Check this series out if you love Holmes or if you want to get a true picture -- cell phones notwitstanding -- of Doyle's character.